This was my first experience using waffle-weave towels, and I found it to be much easier than I had expected. The designs are from an Aunt Martha's pattern. Those are cute. I might have to try the waffle weave ones. I have always stayed away too. I've used the waffle weave before for other towels-I don't use them too much but it is a nice change. Great job! It's not only sticious, it's SUPER! What a cute pattern, and I love your color choices! Ah! THis is a GREAT Idea for coffee-lover gifts!! Nice job! I too love your color choices. I just bought some things from Martha. I am excited to get them and your towels just makes my wait time even worse! Cute! I really love these designs and I have to agree that your color choices are very nice. I like the waffle weave towels. Neat! 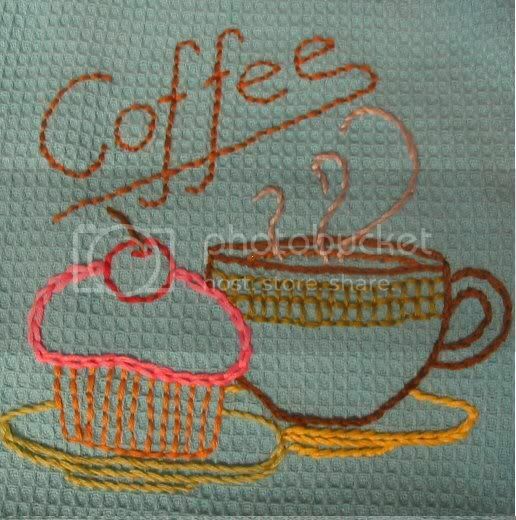 I have been away from embroidery for quite some time, but after seeing your towels, which would look so amazingly good in my coffee-inspired kitchen, I think I will have to dig out my floss and needles. Where do you find Aunt Martha's patterns now a'days? It has been a very long while... Thanks. If God really loved us, our saliva would taste like chocolate. 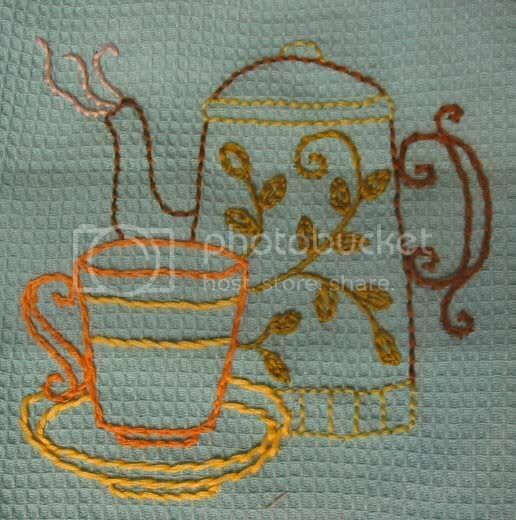 You can find Aunt Martha's patterns at Walmart, or any hobby store that has an embroidery section! If you're looking for a specific pattern, you may have to google it and buy it online.